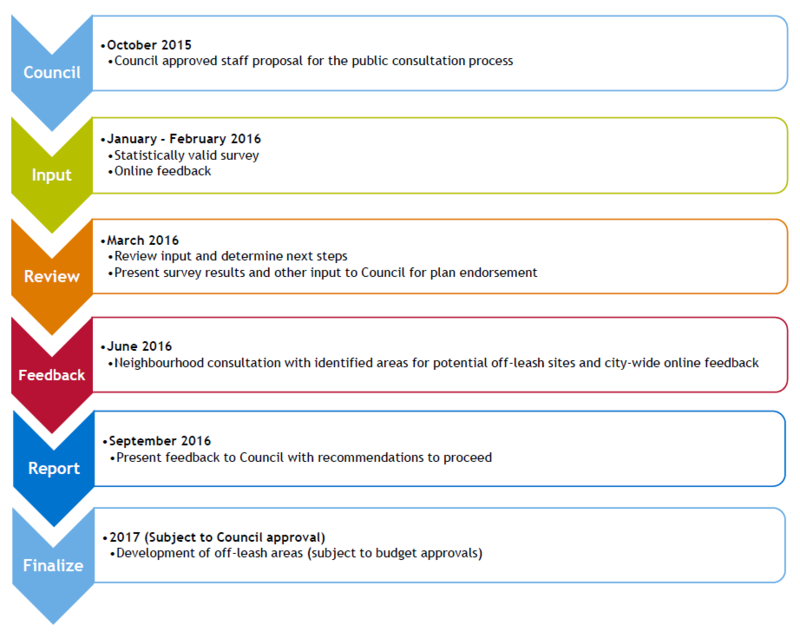 Starting in 2016, we launched a public consultation process to inform a long-term dog park management plan. Data obtained from a statistically valid survey, online feedback and discovery sessions held at proposed locations provided insight regarding public opinion to inform decisions regarding off-leash and on-leash areas. Have your say! Provide feedback at getinvolved.kelowna.ca to help City Council make a decision about the long-term future of Lake Avenue beach access as a dog beach. Cedar Avenue beach access was also considered, and will be brought back to Council after staff further investigate how an off-leash area would work into the comprehensive plans for the Pandosy Waterfront. Munson Pond Park was reviewed as part of the public engagement but not recommended by City staff due to potential environmental impact. The recommendation for these three off-leash beaches as presented to Council in September 2016, came as a result of a public engagement process which included a statistically valid survey conducted in January 2016. This was followed by community feedback discovery sessions in June 2016 at the five sites identified as potential off-leash locations in the city. Neighbourhood based discovery sessions were hosted with adjacent neighbours and stakeholders for each proposed area, along with a community wide session for residents to provide feedback regarding all five proposed locations. A total of 150 exit surveys were collected from local residents and stakeholders at the open house discovery sessions at the proposed sites. Residents were also able to get involved by viewing the information boards and providing feedback online. A total of 247 surveys were submitted online. View the summarized results from the Off-Leash Dog Beaches and Parks Community Engagement Report. 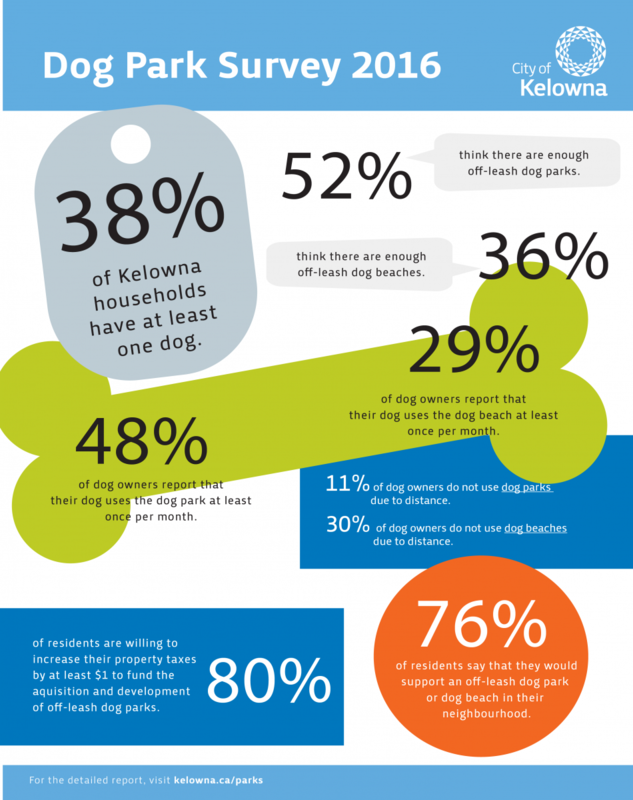 The statistically valid survey represented all Kelowna residents and the results contributed to the identification of the five sites considered as potential off-leash locations. Responses are weighted by age, gender and city-wide distribution to accurately reflect Kelowna's population. NRG Research Group conducted the telephone survey from January 28, 2016 until approximately February 4, 2016. View the complete results from the Dog Park Statistically Valid Survey. The online feedback form was available from January 27 until February 15. There were 1,610 responses with 1,245 completed responses. Majority of the respondents were dog owners (82 per cent). Common themes that emerged from the open-ended feedback included: location suggestions or requests (e.g. water access, trails and mixed use); park design and amenity suggestions or requests; and concerns about dog parks (e.g. cleanliness/dog waste, enforcement, fines, uncontrolled dogs). View the complete results from the Online Feedback Form.